Search our cloud resources for information on cloud-based solutions, trends, whitepapers from leading industry professionals, and more. According to 451 Voice of the Enterprise (VotE) survey, research shows customers have a strong desire for third-party assistance in workload modernization and migration efforts. Download the report for 451 Research's take on our cloud-native adoption capabilities. What are the most popular AWS products used today? 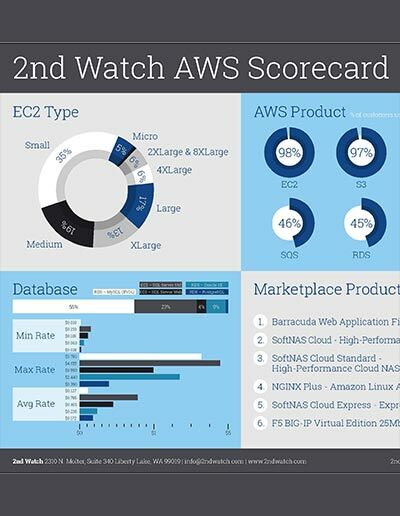 This infographic reflects the percentage of 2nd Watch customers using each AWS product, based on more than 200,000 AWS instances managed, for 2018. 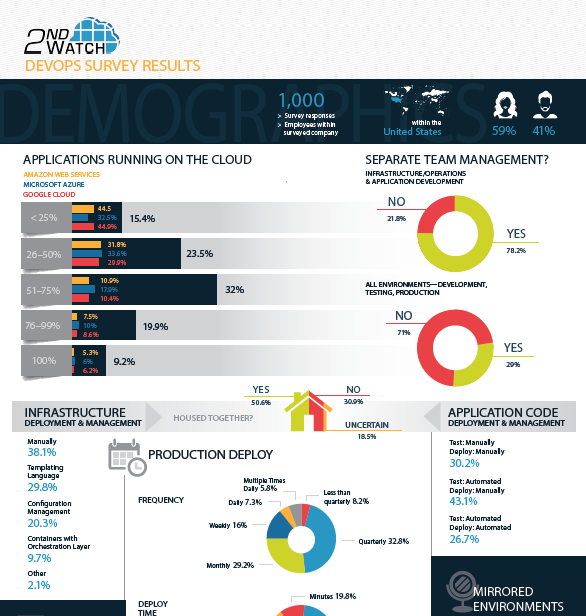 Despite the fact that many companies have begun moving to more DevOps-type processes and adopting tools that fit into a DevOps framework, nearly 80% of respondents said their organizations continue to have separate teams for managing infrastructure/operations and development, demonstrating that enterprises have a long way to go in their DevOps transition. Download our infographic for more findings. 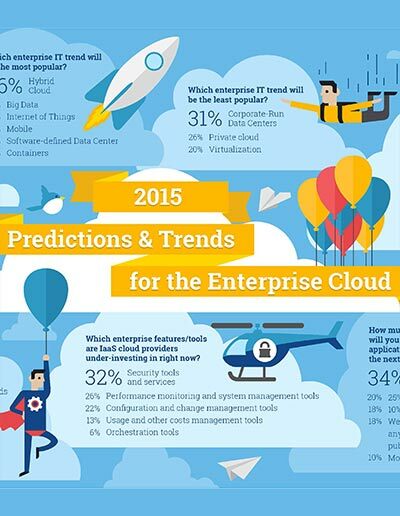 According to 451 Research, third-party tools are needed for effective cloud optimization. Download the report for 451 Research's take on our cloud optimization capabilities. 2nd Watch clients reduce time to market by an average 100 days and save an average of 42% more than when managing cloud services alone. Download our infographic to see how clients like Yamaha, Celgene and Condé Nast have benefited from working with us. 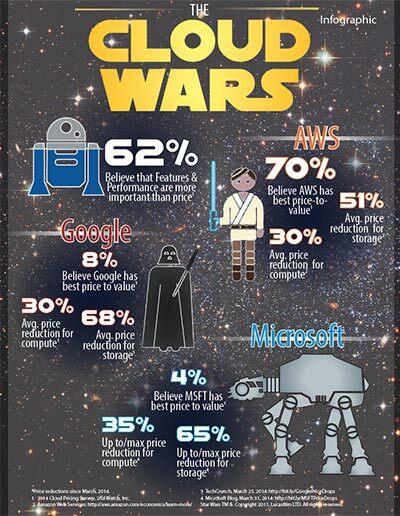 What are the most popular AWS products used today? 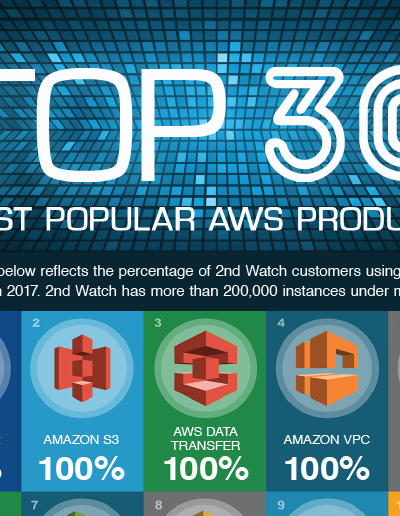 This infographic reflects the percentage of 2nd Watch customers using each AWS product, based on more than 200,000 AWS instances managed, for 2017. 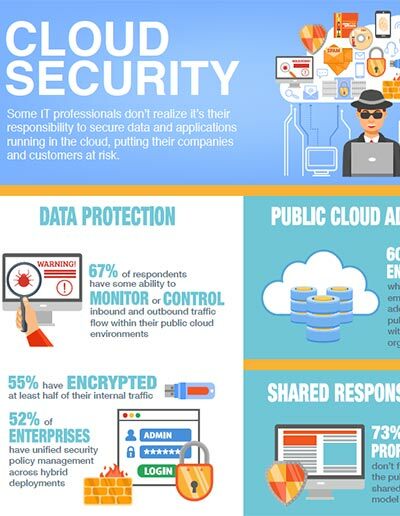 Our survey on cloud security shows that some IT professionals don’t realize it’s their responsibility to secure data and applications running in the cloud, putting their companies and customers at risk. Find out what other cloud security data we uncovered. 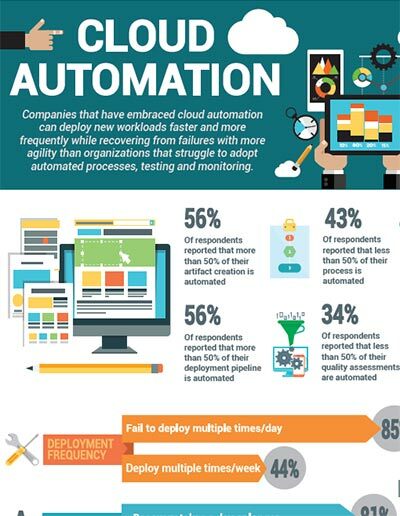 Our research indicates that companies that have embraced cloud automation can deploy new workloads faster and more frequently while recovering from failures with more agility than organizations that struggle to adopt automated processes, testing and monitoring. 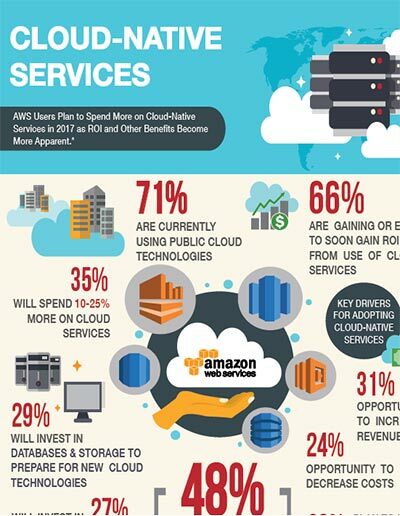 This infographic shows that AWS users plan to increase spend on cloud-native services in 2017 as ROI and other cloud-related business benefits are proven. Find out what areas will see the effects and which are contributing to the growth. 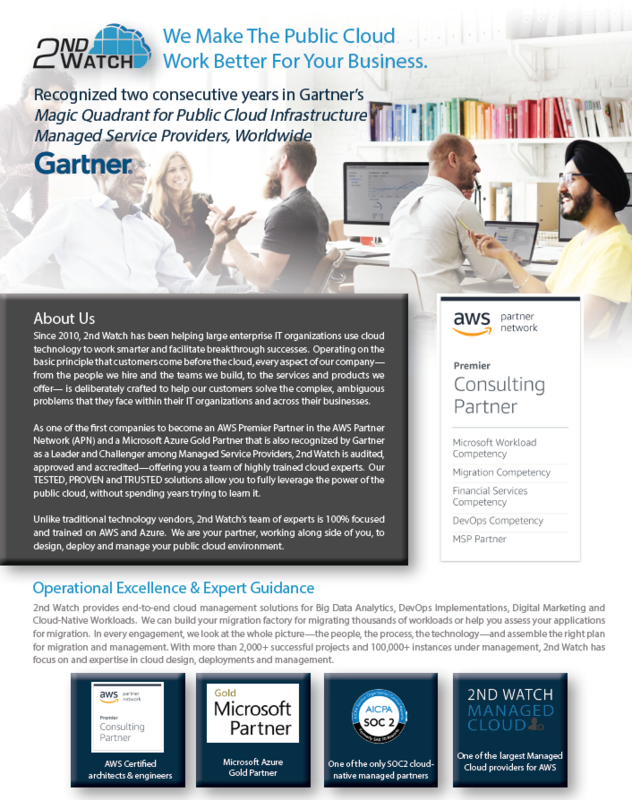 In its February, 2019 Magic Quadrant for Public Cloud Infrastructure Professional and Managed Services, Worldwide report, Gartner has recognized 2nd Watch for the third consecutive year for our completeness of vision and ability to execute. Access the report for a full evaluation of all providers. 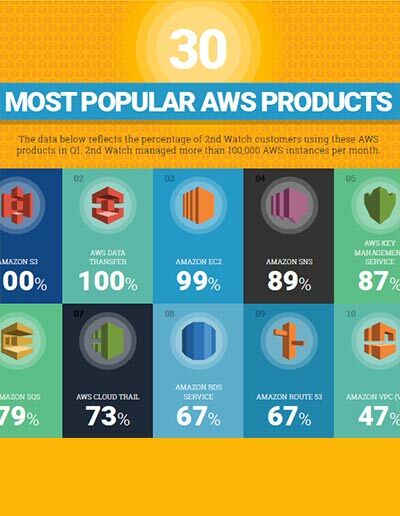 What are the most popular AWS products used today? 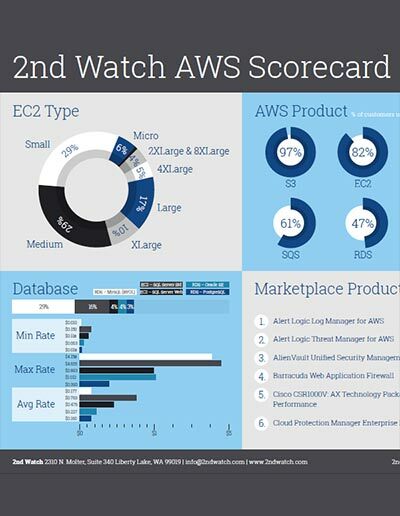 This infographic reflects the percentage of 2nd Watch customers using each AWS product, based on more than 100,000 AWS instances managed, for 2016. 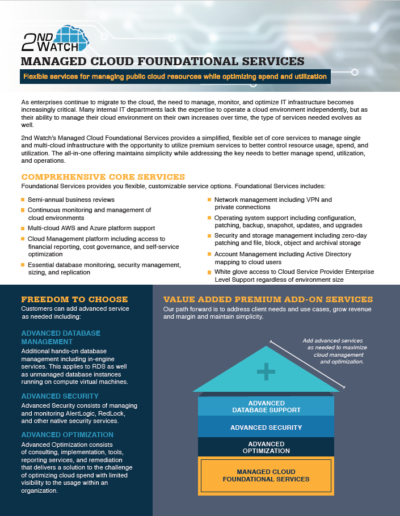 2nd Watch’s Managed Cloud Foundational Services provides a simplified, flexible set of core services to manage single and multi-cloud infrastructure with the opportunity to utilize premium services to better control resource usage, spend, and utilization. The all-in-one offering maintains simplicity while addressing the key needs to better manage spend, utilization, and operations. We make the public cloud work better for your business through our expertise, operational excellence and expert guidance. We are an AWS Premier Partner, Microsoft Gold Silver Partner and audited and approved Managed Service Provider. 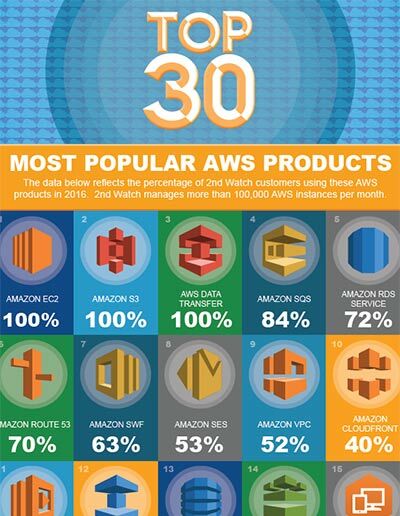 What are the most popular AWS products used today? 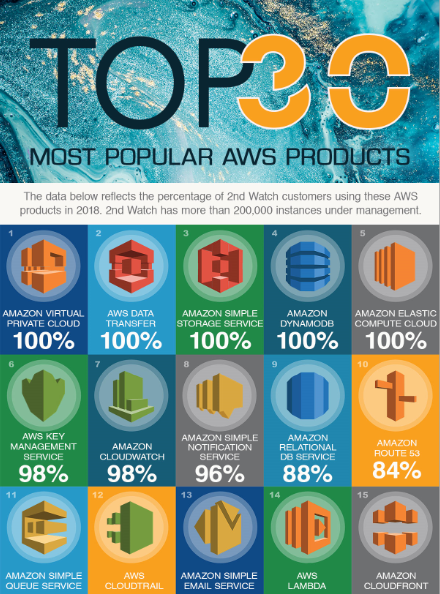 This infographic reflects the percentage of 2nd Watch customers using each AWS product, based on more than 100,000 AWS instances managed. Moving to the cloud means changing the way you work. Securing the cloud means you need to design a scalable security infrastructure – one that’s able to work with new applications and services as they become available. The public cloud may have security built into it, but you still need to build it into your applications. The tools cloud vendors provide help secure connections and manage users, but there’s a lot more that still needs to be done. 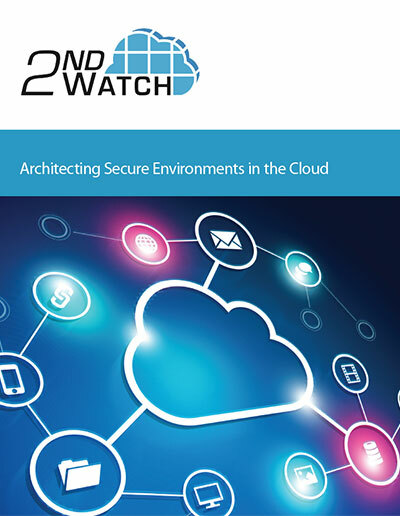 Download our white paper to learn about building secure environments in the cloud. In our Q2 AWS Scorecard, we found more customers using medium EC2 instances and fewer using small, while there was a shift from the US-East to other regions, including EMEA and US West. AWS Directory Service use increased – an indication that enterprise customers are enabling shared services to be utilized by cloud workloads and that companies are extending on-premise directories to the cloud to enable authentication and authorization for infrastructure and applications hosted in AWS. Latest trends from our survey show Big Data, Internet of Things and the Cloud are driving digital marketing initiatives among enterprise companies. Respondents say they’re likely to expand use of these technologies to support digital marketing, and many plan to divert resources from other projects in order to facilitate. 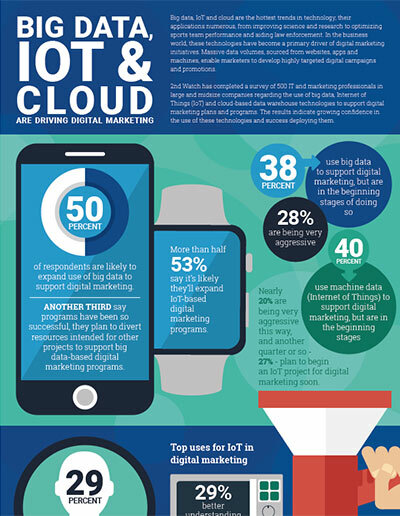 Download our Big Data, IoT & Digital Marketing infographic to learn more. The line between digital and traditional marketing continues to blur. Your digital marketing programs can directly interact with millions of customers, resulting in resource demands that are highly visible and highly variable, yet often temporary.Today’s digital marketing is a critical business function that demands reliable, scalable infrastructure. 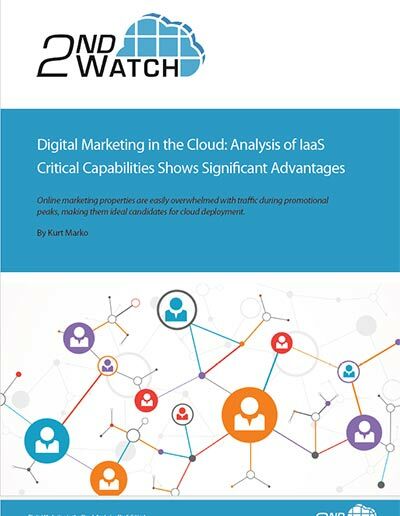 Download our white paper to learn more about why digital marketing properties are ideal candidates for cloud deployments. 80% of companies polled in our 2015 Big Data Survey are already engaged in or will soon begin a big data project, with a large portion of those companies spending as much as $100,000 on big data projects this year. 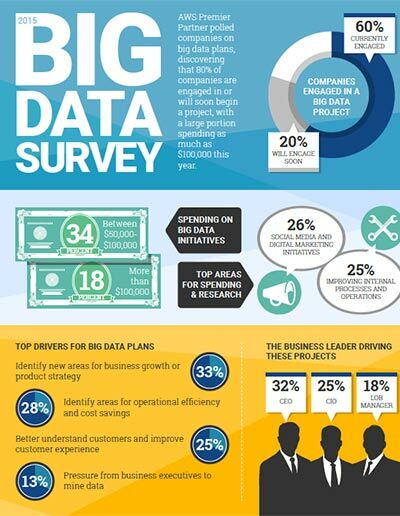 Download our Big Data infographic to find out more from the survey results. Batch processing remains an important tool in helping you make better decisions on how to run your business. However, with the increasing quanitity of data to process and the complexity of the jobs, many enterprises face the challenge of ballooning infrastructure costs when it comes to High Performance Computing. 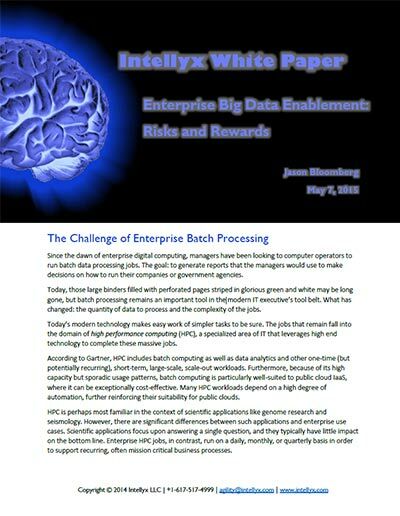 Download our white paper to learn about why many organizations are now turning to the public cloud to address their HPC batch job needs. 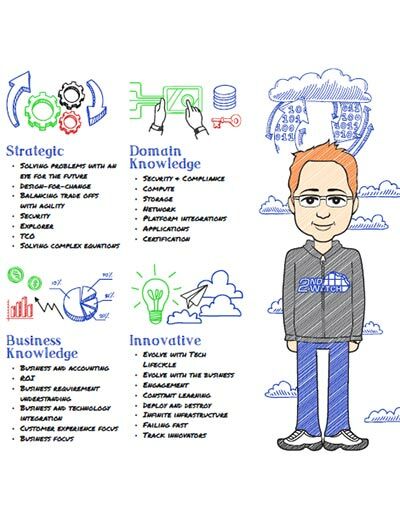 Enterprise Cloud Architect, the coolest job of the 21st century, requires a combination of multidisciplinary skills ranging from intersection of an instructor, strategic advisor, broad domain knowledge, business knowledge and inventor. 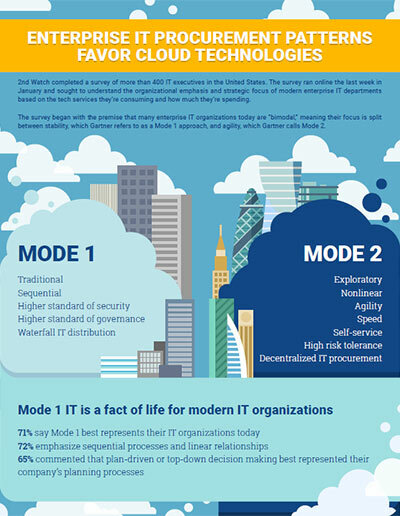 Download our cheat sheet to see who the modern Enterprise Cloud Architect really is. 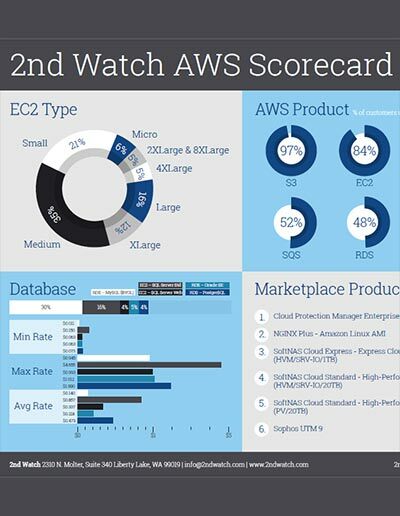 Our newest AWS Scorecard indicates that companies are moving more big data and analytics applications to AWS, Windows-based instances in the cloud are growing while Linux instances are declining, and third-party cloud-based security products are in high demand. Public cloud adoption is on the upswing because companies are seeing benefits that positively affect revenues and benefit customers. Companies that complete the transformation to becoming a Digital Business and public cloud-based enterprise will find powerful new ways to interact with and serve customers and gain agility from end-to-end automation that saves money and time. Learn more with our Digital Business white paper. In an effort to better understand the relationship between cloud computing and digital business in large organizations, our latest research has uncovered a stronger than expected connection between cloud technologies and digital sales and marketing programs. 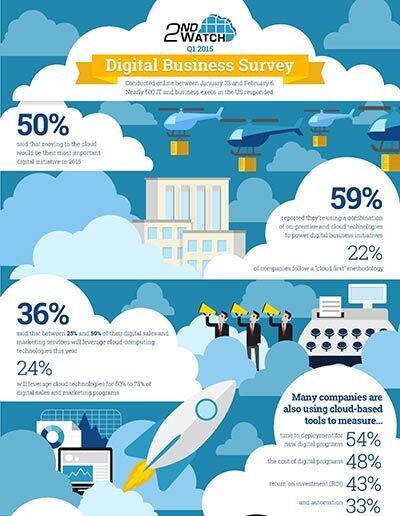 Half of all survey respondents said that moving to the cloud would be their most important digital initiative in 2015, and 60% say cloud tools will support digital sales and marketing programs, but issues still exist. 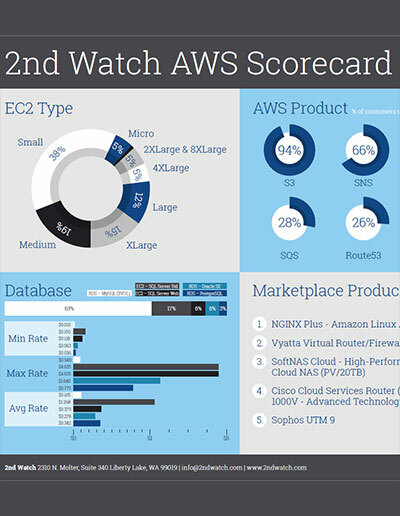 In the second of our quarterly Amazon Web Services scorecards, we found some interesting insight into what services and instances are being used by Amazon’s customers. Among our user base, we found a significant uptake in network access storage (NAS) products. Amazon EC2 is the most popular service, with 98% of customers using it, followed by Amazon S3 (97%), and Amazon SNS (65%), among other stats on usage trends. Our survey shows that most companies plan to increase public cloud spend by at least 15% in 2015, indicating greater confidence in cloud infrastructure and expanding budgets for public cloud workloads. Consistent cost savings derived from the use of public cloud infrastructure versus corporate-owned datacenters was cited as the biggest potential benefit to running more public cloud workloads in 2015. 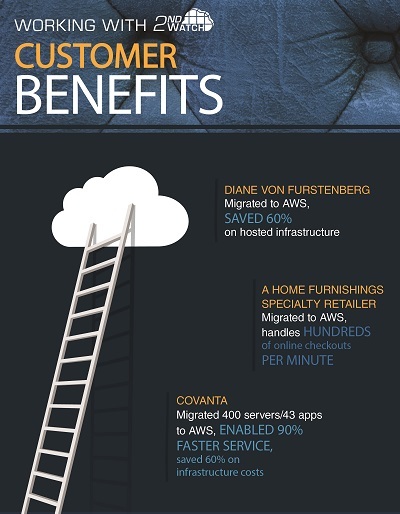 Find out how cloud cost savings are realized. With over 28,000 possible service offerings, AWS cloud pricing can get complex! 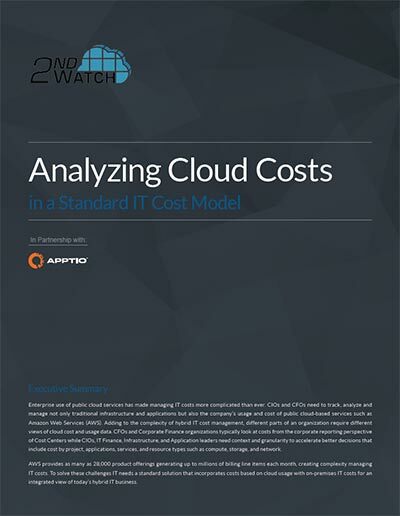 We break down cloud costs and billing to help you understand cloud spend in context of the enterprise technology business. Despite untapped promise in the public cloud, our survey found that enterprise IT says managing public cloud workloads is just as difficult as managing internal systems and that commercial third-party tools and services are necessary to help reduce complexity with their public cloud environments. 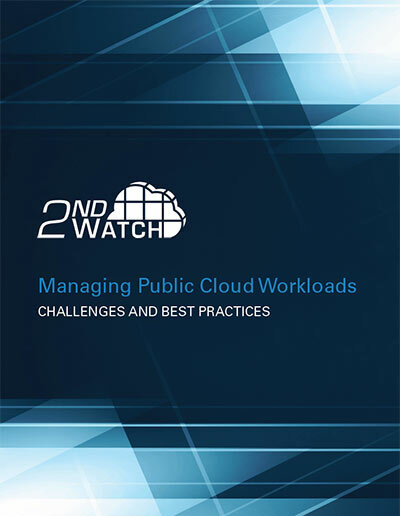 We take an in depth look at the challenges and best practices in managing public cloud workloads. 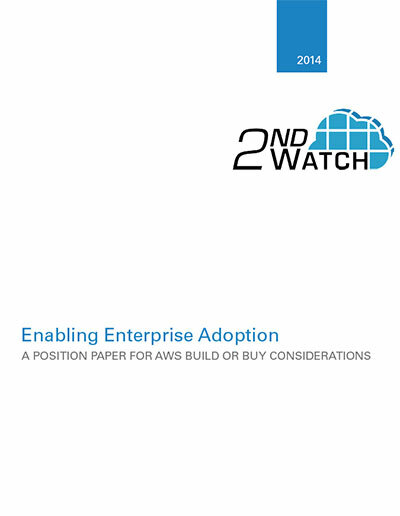 Do you want to know how to accelerate your cloud adoption? Our 2W MGZN is full of useful articles and tips on migrating to the public cloud, including the public vs. private cloud debate, Yamaha and Diane von Furstenberg success stories, and tools for bulk server migrations. 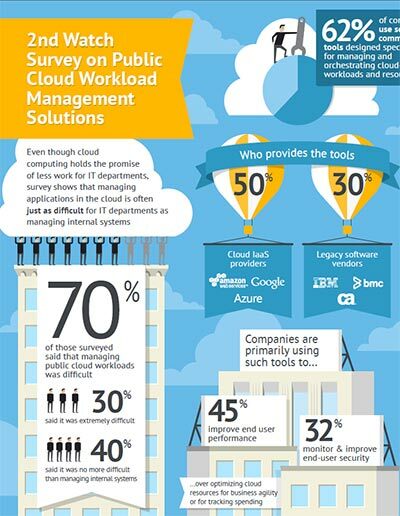 Despite untapped promise in the public cloud, our survey found that enterprise IT says managing public cloud workloads is just as difficult as managing internal systems and that commercial third-party tools and services are necessary to help reduce complexity with their public cloud environments. In the first of our quarterly Amazon Web Services scorecards, we found some interesting insight into what services and instances are being used by Amazon’s customers. 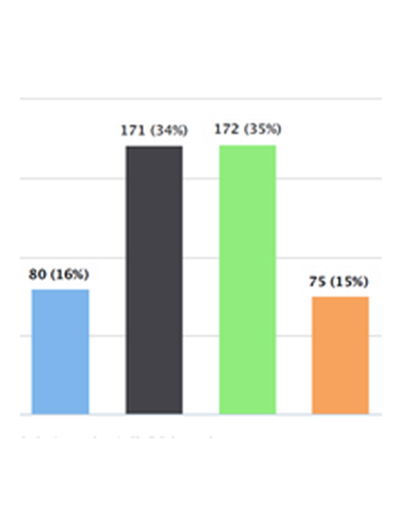 Among our user base, Amazon S3 is the most popular AWS service with 94% of our customers using the storage service, among other stats on usage trends. Many enterprises contemplating public cloud deployments go through a classic decision-making process applied to many new infrastructure technologies: do I build it myself or do I buy it from the professionals? To develop the right strategy and frame the build or buy debate, several considerations need to be made when it comes to Infrastructure as a Service (Iaas), and in particular Ama­zon Web Services. We see very common themes around four major decision point areas: design, construction, ongoing mainte­nance and insurance. 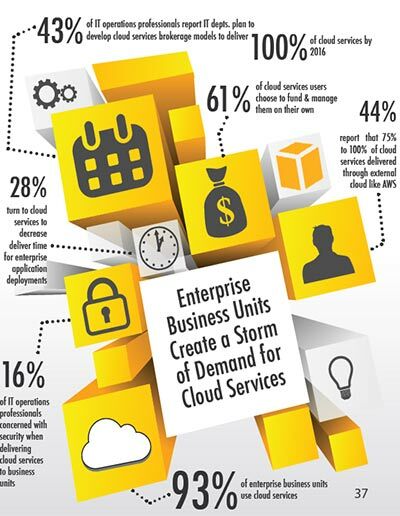 The Cloud Demand survey indicates that a large majority of enterprise business units are using cloud-based services, and that most of those are choosing, managing and funding them on their own rather than waiting for IT departments to create and deploy applications that can help them to achieve their goals. Almost half plan to develop cloud services brokerage models in their quest to deliver cloud services by 2016. Join the cloud conversation with this issue of the 2W MGZN. 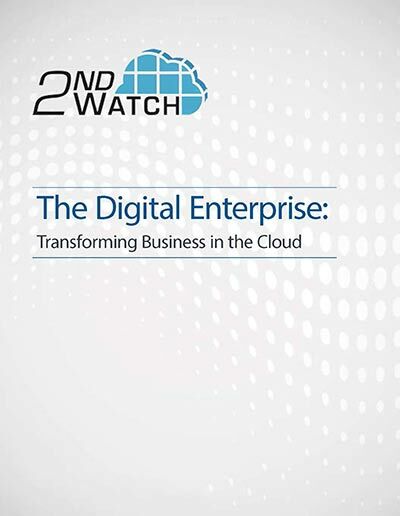 Find out what the future of cloud pricing models holds, dig into the build versus buy discussion, learn about the next generation of private cloud, and find out how Iris Autograph™ achieves enterprise-level security and cloud scalability with AWS and 2nd Watch. According to our survey, cloud provider price cuts are driving increased investment and innovation in cloud-based projects. However, despite ongoing price competitiveness among cloud infrastructure providers, a majority of survey respondents said features and performance were more important than price in deciding which vendor to engage. Find out what the future of cloud computing holds in this issue of our 2W MGZN, with helpful articles on overcoming cloud uncertainty, best practices for autoscaling your application, and Adobe’s Business Catalyst’s story on shutting down three global data centers and migrating to AWS with 2nd Watch.